Algae control in ponds is a very important part of maintaining a healthy pond. In very high densities, algae blooms may discolor the water and out-compete, poison, or asphyxiate other life forms. Some algae are toxic to humans and dogs. Excessive algae growth can indicate problems with water quality. Water can become unsuitable for fish, swimming, and other animals. Nutrient pollution such as excessive nitrogen, phosphorous, carbon, and potassium can originate from fertilizer, farm runoff, septic systems, and decomposing lawn clippings. Prevention along with a proper pond algaecide should be employed for optimum pond algae control. For pond algae or lake algae control, we recommend the copper based algaecide Mizzen® to help control nearly all types of Planktonic Algae, Filamentus Algae, and Chara. Mizzen® is an EPA approved algaecide that is safe for most fish, however, it is not recommended for use where there are Koi, Trout or Channel Catfish. Simply spray Mizzen® evenly across the surface or spot treat algae mats as needed. No swimming restrictions apply. There are some products available that will slow the regrowth of algae. Pond control products such as SparKlear® and PhosControl® will reduce the nutrients available to the algae. For recurrent algae blooms in your pond or lake, we recommend that you re-apply Mizzen® in 2 - 3 week intervals. For severe algae blooms, avoid oxygen depletion by applying to one half or one third of the area at a time. Allow 10 - 14 days between the applications. Break up any large mats of algae before applying the algaecide. Apply Mizzen® when algae first appears, and when the water temperatures are above 60° Fahrenheit. Refer to label for dosage rates and other instructions. Algae is commonly referred to as "pond scum" or "pond moss" and typically forms greenish mats upon the water's surface. Algae usually begins its growth along the edges or bottom of the pond and "mushrooms" to the surface buoyed by the oxygen it has produced. Algae can also form fur-like growths on logs, rocks, and even the backs of turtles. The texture of these growths may be slimy, cottony, or coarse. There are many groups of algae. The green group (clorophyta) has more than 7,000 species in a variety of habitats, including some of the most plant-like. Algae can be found in almost any habitat on earth as long as moisture is there at some time, even if that time is very short. Algae differ from most pond plants or lake plants in that they lack roots, leaves and other structures. Algae can essentially be divided into two different physical categories: Planktonic Algae and Filamentous Algae. While species of planktonic algae can only be indentified under a microscope, abundant growth is easy to identifiy visually. 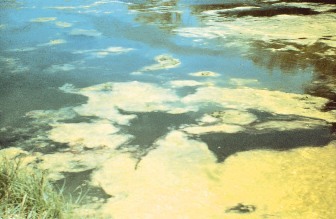 A Planktonic Algae bloom can appear as a paint-like scum on top of the water's surface. The water column turns green throughout and is often described as "pea soup." Planktonic Algae can sometimes be mistaken for other growth, such as Duckweed or Watermeal (two common plants found in ponds and still lake waters). You may easily determine if your waterbody has Duckweed or Watermeal by placing the bottom of a glass jar or drinking glass into the water. Remove the jar or glass. Duckweed will look like little flat leaves with small root hairs. Watermeal will look like small green grains. Filamentous algae may seem like long stringy hairs, cotton-like in appearance. Individual filaments are a series of cells joined end to end which give the thread-like appearance. Filamentous algae can form thick, greenish looking mats on the water's surface, and many times it is attached to a substrate such as rocks, logs and other plants. Some filamentous algae may be bright green and slimy, while some may look more like "horse-hair" with a course texture, like that of steel wool. Cyanobacteria, also known as Blue-Green Algae, can contain a harmful bacteria and be dangerous to pets and humans. The scum can often smell like sewage or manure. 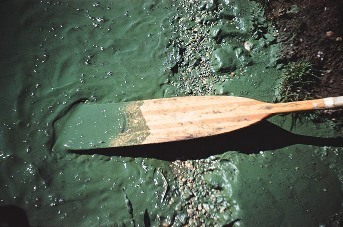 Not all blue-green algae is toxic. Cyanobacteria, looks like someone took a can of green paint and dumped it into a body of water. This bacteria can also appear reddish-purple or even brown. It is also known in the marine environment as "red tide." Harmful algae blooms can decrease the water quality, produce an awful odor or taste, and cause the production of algal toxins. These toxins could cause serious illness or death. Toxic alga coincides with a lot of sunlight, warm temperatures and slow moving water. It can be problematic if the water is left untreated. There is one form of algae that resembles submerged plants. The common names for these are Chara and Stonewort. Chara is very common on the bottom of lakes and ponds. Chara often looks like a matted tangle of plants, forming a carpet on the lake or pond bottom. It has a crusty, course texture and a musky odor when crushed in your hands. Chara has stem-like braches with forked leaves, and leaf-like structures that are whorled around the stem in fairly uniform intervals. Also look for little bumps or spots on the leaflets. Chara can only be treated early in its growth cycle. Its course texture later in its growth cycle is caused by the absorbtion of mineral deposits. Once chara has absorbed these materials, it begins to have an innate resistance to algaecide. Because of this, we recommend that chara be treated for early in its growth cycle before it has a chance to absorb these mineral deposits. 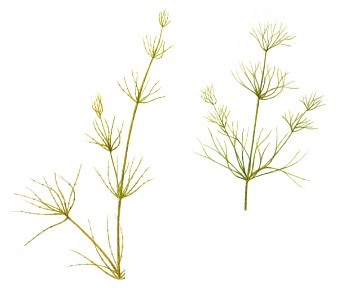 Stonewort is similar, but has smooth branches and the stems are more translucent. The leaves also appear to be covered in a green gelatinous substance. Stonewort also lacks the musky odor found with Chara. Each of these algae varieties is controlled with an algaecide such as Mizzen®.